The calendar shows that we still have a few days to go until the "official" start of spring, but the weather is most definitely springy. We haven't hit prime pollen season yet, but the flowering trees are in full-on glory here: Bradford pears, redbud, and deciduous magnolias are all flowering profusely. I just love these days when the sun shines bright and the sky is Carolina blue. In the spirit of the season, I'm making some easy, inexpensive changes in my decorating, too. I also won this lovely pitcher from DaySpring. The inscription reads "Thankful for simple graces." That deserves an Amen! 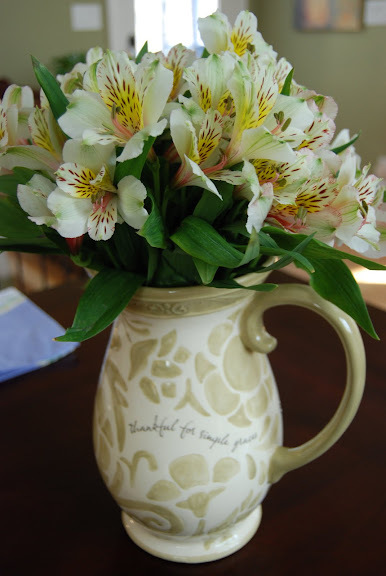 I love the way it looks on my table holding grocery-store alstroemeria. (These flowers are a frugal decorator's dream--they're beautiful, cheap, and the blossoms last a long, long time.) Here's a tip for arranging your own flowers: cut the stems. You want to see a profusion of flowers above your container, not stalks. So chop off those long stems! And to make your flowers last even longer, add a couple of drops of household bleach to your water. To set a fun springtime table, I pulled out the green chargers I bought on clearance at Target after Christmas. I paid $2.50 for eight chargers. Aren't they a pretty springy green? And last but not least, I added a touch of spring to my dining room table by spreading out the darling runner I won from Melissa of Melissa's Heart and Home! I was the lucky winner of her spring giveaway. Thank you, Melissa, for sending me so many wonderful goodies! Thanks to the blessing of winning some of these products, I spent less than $20 and added a lot of springtime to my house. What are you doing to add some spring to your nest? I love your house Richella! I was raised in Southern Calif. by the beach, so I love your shells with the candles! And I love the Dayspring pitcher with the flowers too. Have a lovely weekend Richella. Hi Richella, I've seen your picture icon on so many blog comments that I also visit, so I'm happy to finally visit your blog. I am envious that your flowering trees are in bloom...there isn't a bud on anything here! The pitcher of flowers is so lovely! Happy Spring...I'm following now! I LOVE the tray! I don't have one, but I do have a wooden box that I found just the other day hidden in my junk pile...I mean storage room. I love the idea of using tea lights in it with different things for different seasons! It looks a lot like spring in and around your home, Richella! I love the planter and the pretty tray! I'd love to get out and plant some pansies but I am afraid we still might get another cold frost. Maybe in a few weeks. Enjoy all of your wonderful goodies! your shells are so beautiful! I'm ready for spring too. It all looks so beautiful and spring like at your lovely home Richella. The table runner looks precious and fits your decor' very well. I'm glad you are enjoying everything. Monday we had 3" of snow; yesterday it was 80 degrees! That was enough that today for the first time I saw forsythia and daffodils blooming, and buds on the trees. Yay! Your spring decor looks so pretty! I really like that Dayspring tray. Did you tell me where you are in the Carolinas yet? I am in Greenville, SC. Where are you? I think they were $5 a set with 75% off, as I recall- yours, too? Haven't gotten outside yet, like you have. Pansies are so happy, aren't they? Blessings to you and your beautiful home! That tray and pitcher are GORGEOUS!!! I love the seashells you added to the tray and the little candles. Such pretty flowers too! Love it all!!!! I love all of your spring touches. Very pretty. I am such a slacker, I have my bins out but haven't done anything.